Dwarf bunnies are like other pet rabbits, only smaller. This adds to their adorableness, making them popular pets. They're affectionate, playful, relatively inexpensive and typically live seven to 10 years when well cared for. However, dwarf rabbits are fragile, so an adult should be the primary caregiver and children should be monitored with them. Your dwarf bunny requires an indoor cage with room for her to move about. At minimum, get a dwarf rabbit a cage that's 4 feet wide, 2 feet deep and 2 feet high, but bigger is better. Wire cages are a good choice, particularly because they have adequate ventilation, but wire floors hurt and eventually ulcerate fragile bunny feet; buy a cage with a solid bottom or cover the wires with wood or corrugated cardboard. Cover the cage bottom in a thick layer of straw, hay or aspen shavings. Remove soiled bedding daily and replace it all and clean the cage thoroughly once or twice per week. Dwarf rabbits require unlimited access to clean timothy or brome hay. You can use the hay as bedding, but make sure there's always unsoiled hay for munching elevated on a low rack attached to the side of the cage. Fresh, clean water must also always be available in a rabbit water bottle that affixes to the cage or ceramic bowl that won't easily tip over. You also need a high-quality pellets-only rabbit food. 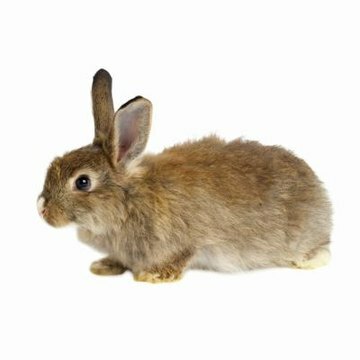 Your dwarf rabbit can't have seeds, nuts, colored morsels and other tidbits found in many rodent food mixes. This too should be in a sturdy bowl. Feed your dwarf bunny free choice until she's 6 months old, then limit her to about 1/8 cup of pellets per day. Feed your dwarf rabbit 2 cups or more of fresh leafy greens daily too. It's easy to litter train your dwarf bunny, who's smarter than you may realize. She'll naturally choose one corner of her cage to function as her bathroom. Put an appropriately sized litter box in that corner and line it with newspaper. Then add in pelleted paper litter or any grass hay besides alfalfa. Never use pine or cedar shavings or clay cat litters, all of which are potentially hazardous to your dwarf rabbit. Empty and replace the contents of the litter box daily. You need a carrier for your dwarf bunny for trips to the vet. Your pet should cozily fit inside with room to maneuver. She also requires chew toys for stimulation and teeth maintenance. Cardboard and commercially available rabbit chew sticks are suitable options. Provide a digging box for your bunny to satisfy her natural urge to dig. A cardboard box filled halfway with soil or shredded paper works well. Your dwarf rabbit also needs a safe, secure area outside her cage in which to play and exercise. Rabbit playpens are a convenient accessory. Rabbits easily get injured, chew wires and furniture and get into other trouble when allowed to roam free, but daily, supervised out of cage time is a must. If you take your dwarf bunny outside, remember she can dig out under a fence. Also, even the approach of a potential predator can trigger a heart attack.